I have long championed the idea that for dialogue to exist there must be two different people. The fusion that effaces the characteristics of each participant seems to me as dangerous as the disappearance of biodiversity in the world today. The reduction of differences is, alas, widespread, on the pretext of making this music more accessible to all; but in reality when the micro-intervals of Ottoman music, its tempi and its relationship to time are not respected, the result is merely to make it more insipid. That is Denis Raisin Dadre, director of vocal group Doulce Mémoire, writing in the sleeve notes for the newly released CD La Porte Félicité. 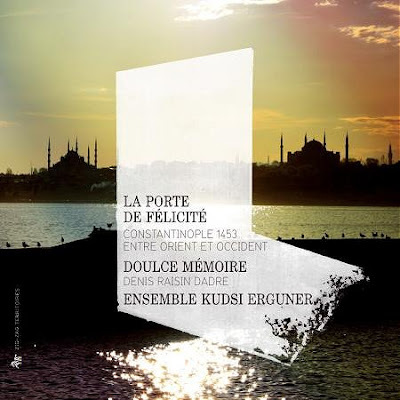 The project from the French independent Zig-Zag Territoires label is a collaboration between Doulcé Memoire and the Ensemble Kudsi Erguner whose eponymous founder and Sufi musician featured in a recent post. La Porte Félicité is a musical dialogue between the very different Ottoman and European cultures that co-existed in Constantinople in the fifteenth century, and it juxtaposes works by Christian composers such as Guillaume Dufay and Gilles Binchois with music from the Muslim community. Denis Raisin Dadre’s point about preserving differences is relevant to the fashionable fusion movement in world music, but it is also very relevant to the debate about the future of Western classical music. The new orthodoxy dictates that classical music should remove its points of difference – venue, dress, concert etiquette, etc – to make it more accessible. Which in marketing theory – the discipline from which the new orthodoxy has sprung – makes no sense at all. Marketing is about building and communicating brand value, and the value of classical music lies in the very differences which are now being eroded. Is there a marketing case study where a brand has successfully increased its value by dumbing-down. Can you imagine Aston Martin redesigning its cars to be more like Nissans in order to boost sales? As Denis Raisin Dadre explains, when the defining characteristics are not respected the result is merely insipid.